The poster shows an image of a child sitting on a sofa and talking to a therapist. The therapist writes notes in a notebook as he listens to the child. The text above and below the image reads "Out of answers? Sometimes the best way to be a good parent is to ask for help. You don't know what you don't know." Immediately below the main image and text is a short passage explaining the poster. 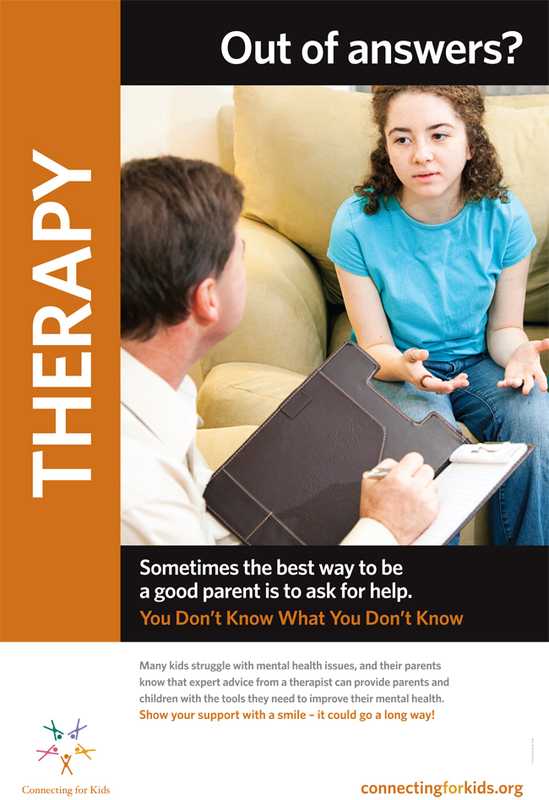 It reads: "Many kids struggle with mental health issues, and their parents know that expert advice from a therapist can provide parents and children with the tools they need to improve their mental health. Show your support with a smile - it could go a long way!"